AIGLULF (AGILULFUS), a well-educated young man who became a hermit following the repose of his parents. St. Aigulf quickly became known for his great personal sanctity. When the See of Bourges fell vacant circa 811, St. Aigulf was chosen to be the bishop. Quite reluctantly, he was consecrated Bishop of Bourges. He was an excellent shepherd of his flock, St. Aigulf was in attendance at the Council of Toulouse (829), and was one of the forty-three bishops who sat at the Synod of Thionville (835) who deposed Ebbo, Archbishop of Rheims, for his role in the revolt against King Louis the Pious. St. Aigulf remained Bishop of Bourges until his repose circa 836. AUSONIUS, (Third Century), the first Bishop of Angoulême in Aquitaine, and a disciple of St. Martial of Limoges (30th June). No further information on his life is extant. BOBO (BEUVON), a Provençal soldier renowned for his role in the defence of Provence against the Moors who were terrorising the region. St. Bobo left the military and became a hermit. While on a pilgrimage to Rome circa 985, St. Bobo reposed at Pavia in Lombardy, and was buried at Voghera. BOETHIAN, (Seventh Century), a native of Ireland and disciple of St. Fursey (16th January), St. Boethian travelled to Picardy where he founded an abbey in Pierrepont 15 km/9 1⁄2 mi north-east of Laon. He was murdered by criminals whom he had previously castigated for their immorality. CASTUS and ÆMILIUS (EMILIUS), two north African martyrs of the Decian Persecution. When first arrested, and tortured they renounced Christ and were released. They soon repented their apostacy, and were re-arrested. This time the remained steadfast in their faith and were burnt to death, circa 250. CONALL (COEL, CONALD), St. Conall was a seventh century Abbot of Inniscoel, Co. Donegal, in Ireland. There is a holy well at Inniscoel dedicated to him. Nothing further is known of his life. FAUSTINUS, TIMOTHY, and VENUSTUS, three martyrs in Rome during the persecutions under Julian the Apostate circa 362. FULK, a pilgrim on his way to Rome circa 600 who stopped at plague-stricken Santo-Padre or Castrofuli near Arpino in present-day central Italy to minister to the sick. Whilst caring for plague he contracted it himself and died. St. Fulk is the patron saint of both Santo-Padre and Castrofuli. HELEN, the Acts of Saint Amator of Auxerre (1st May) speak of St. Helen as a virtuous and godly young woman and a wonderworker. 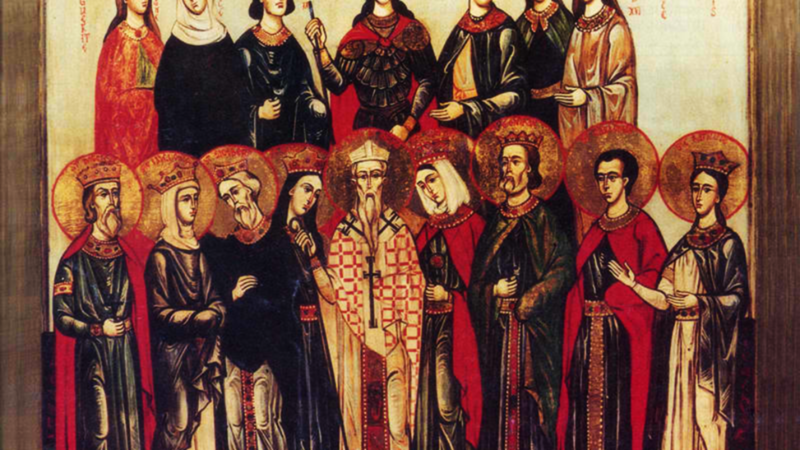 St. Helen also assisted at the deathbed of St. Amator. JOHN of PARMA, a priest from Parma who was made canon of the city’s cathedral at an early age. On one of his six pilgrimages to Jerusalem, St. John received monastic tonsure, and from 973 until his repose circa 982 was Abbot of St. John’s Abbey in Parma. JULIA, (Fifth Century), a member of the Christian nobility of Carthage in Africa Proconsularis, and patron-saint of Corsica. St. Julia was captured by soldiers of Genseric the Vandal during the invasion and sack of Carthage, sold into slavery. The ship which was transporting St. Julia and her owner to Gaul, made a stop in Corsica during a pagan festival. When pressed to take part in the festival, St. Julia refused and was beaten and then crucified. MARCIAN (MARIANO) of RAVENNA, the fourth Bishop of Ravenna from circa 112 until his repose circa 127. Nothing further seems to be known of St. Marcian’s life. QUITERIA, (Date Unknown), a saint, most likely of Spanish origin, who is venerated on the French-Spanish border, where several town have claimed possession of her relics. Unfortunately, there is no reliable information on St. Quiteria. 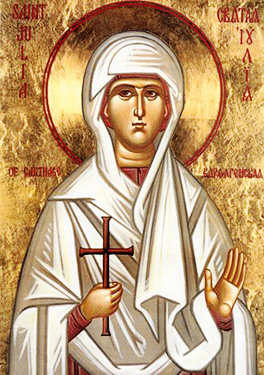 If St. Quiteria flourished during a period of persecutions of Christians, it is highly probable she was a martyr. ROMANUS of SUBIACO, a monk near Subiaco and friend of St. Benedict of Nursa (11th July), whom St. Romanus encouraged and provided with food in the first years of St. Benedict’s life as a hermit. A widely-held legend says St. Romanus went to Gaul where he founded a monastery near Auxerre. However, there is no historical evidence to support this. St. Romanus reposed circa 560.